Helsinki is actually a really amazing city. 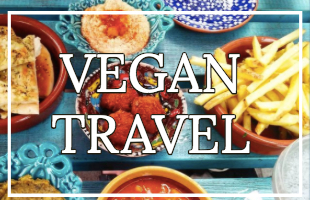 Our initial reaction though was that it was cold and expensive, but once we got over that we ended up really enjoying it - it's clean, everyone's really friendly and unlike some other capital cities you don't feel threatened or like you're going to be mugged. Go Helsinki! We are so pleased we did House Sitting Finland here. But back to the cold and the expense. We have written a list of 14 awesome places you can go to in Helsinki which are all FREE. Most of them are INDOORS too, but if you really really hate the cold, just come in the summer! 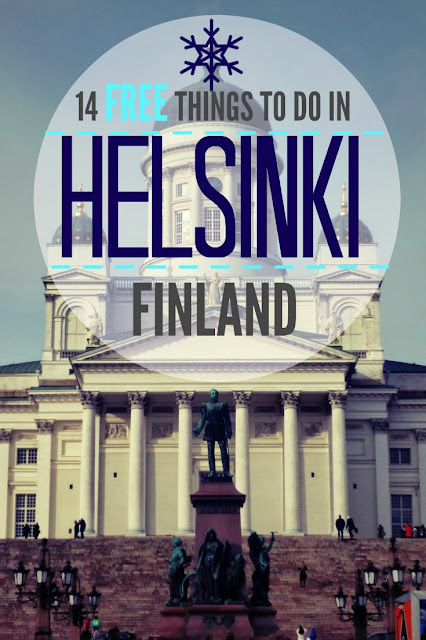 Now this list, like Helsinki itself, is a little weird. It's one part churches and one part naked statues and Moomins. But bear with me. Hopefully it will have a bit of something for everyone (and hopefully I won't offend anyone). 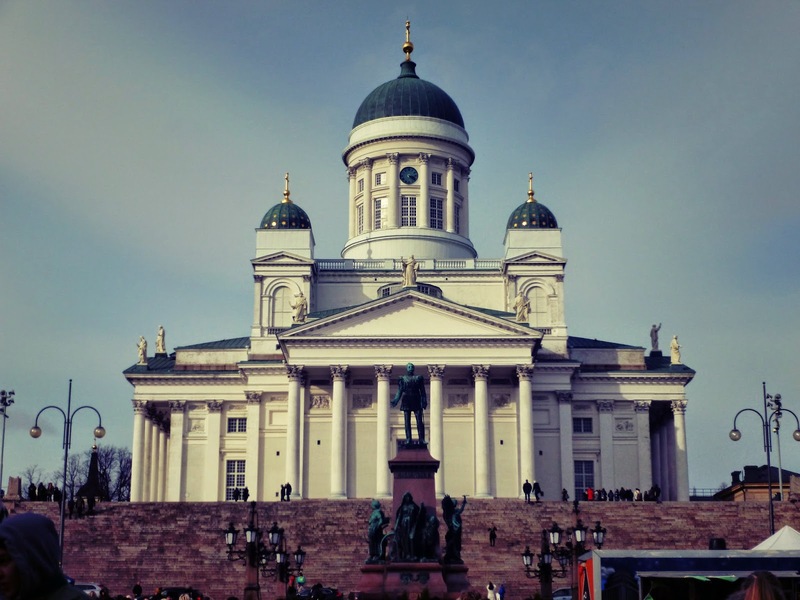 Helsinki Cathedral is the iconic symbol of Helsinki - it's like the Eiffel Tower of Helsinki. 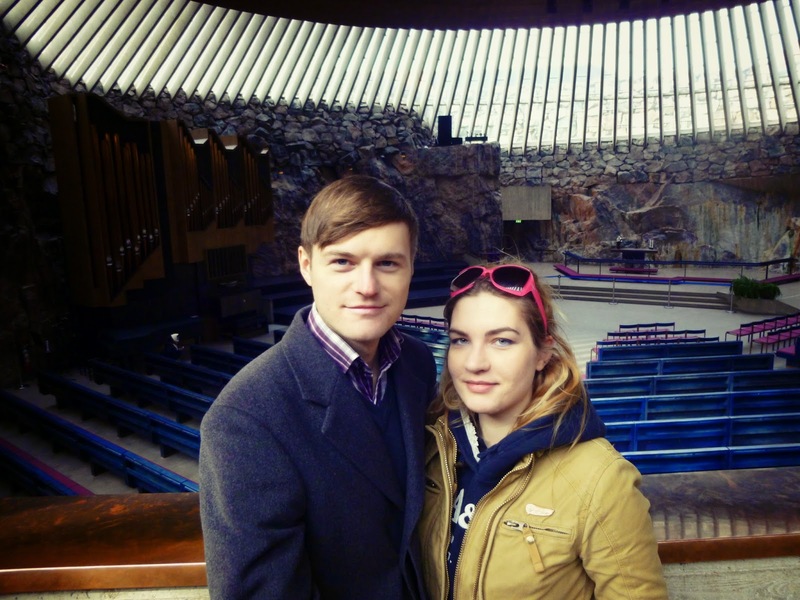 We really love the stars on the dome and that it's free entry and warm inside, but really if I'm honest it wasn't our favourite cathedral/church in Helsinki. It's a little boring inside - not spiritual or creepy or anything. Still, it is impressive from the outside and the quintessential symbol of Helsinki, so you can't miss it. The Moomins were one of my favourite cartoons as a kid. And they come from Finland! 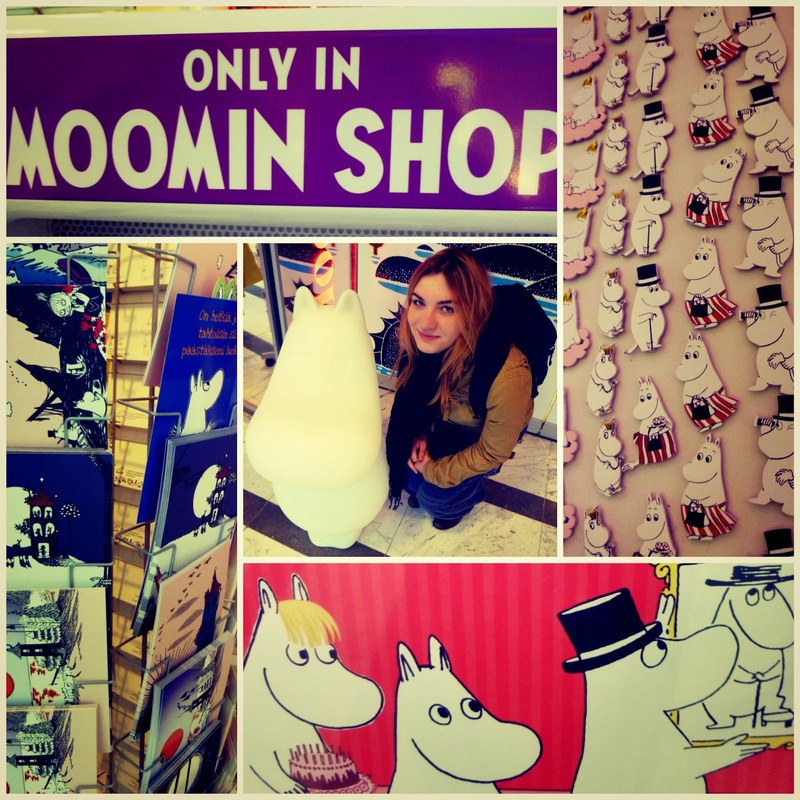 There is a lot of Moomin merchandise dotted around Helsinki - especially in the supermarkets and the souvenir shops. But if you are a super Moomin fan (which you should be) you have to head into one of their shops. I spent over half an hour in the Moomin shop in the Forum shopping centre before Tanbay put his foot down and dragged me out. Heheh. Browsing is free (and not frowned upon). But there is 10% discount for newbie shoppers (yey). 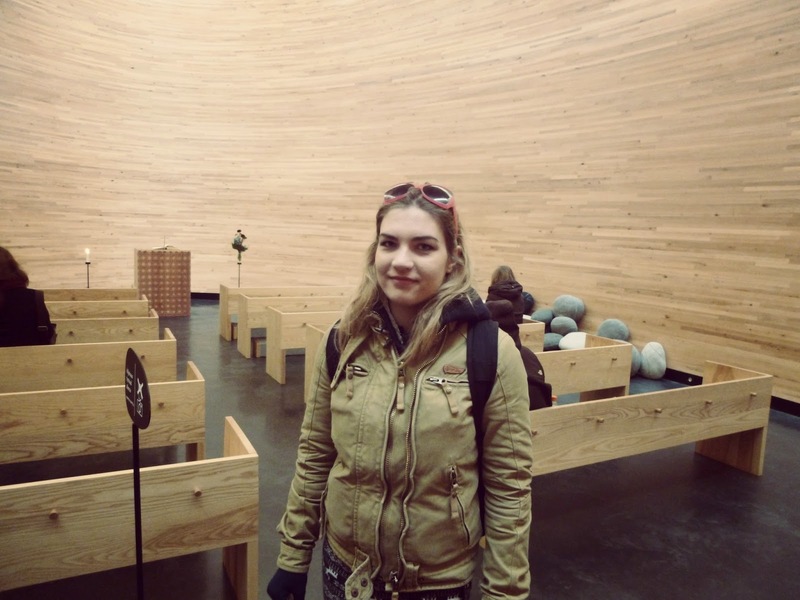 Three minutes walk from the Moomin Shop is the Kamppi Chapel or Chapel of Silence. We understood that it was a religionless church and a quiet oasis in the middle of the city. It definitely was quiet, but there were also a lot of bibles - in about 30 different languages. Anyway, with free entry it's definitely worth a look, we loved all the wood! 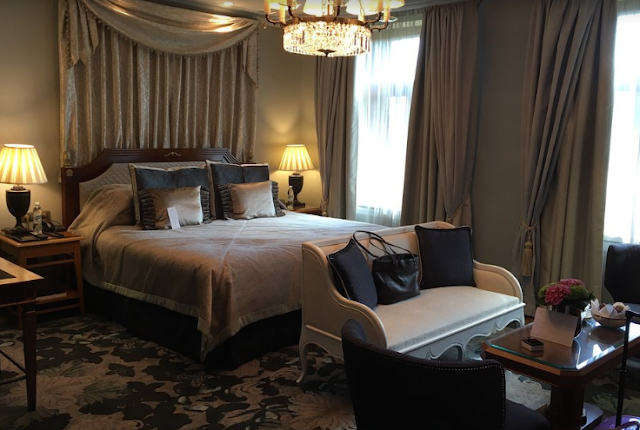 It really was peaceful and the staff were very friendly. 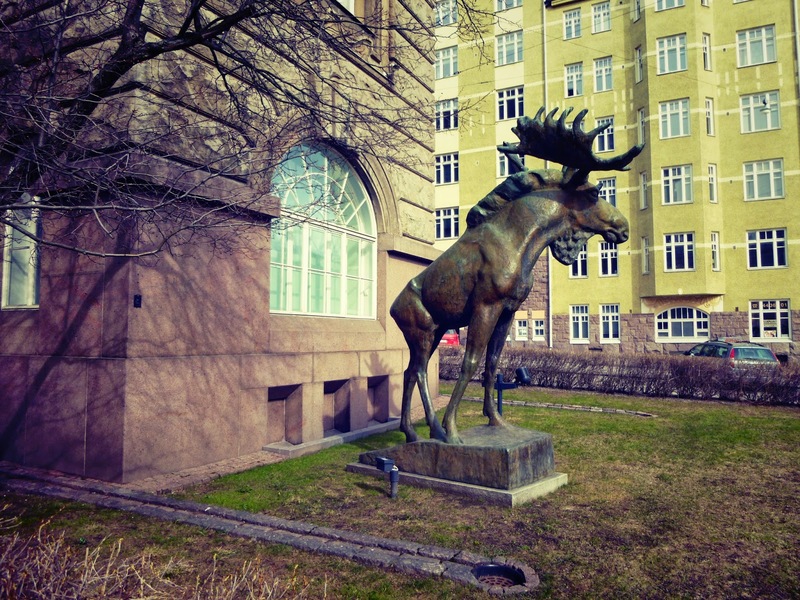 Outside the Natural History Museum is a great statue of a moose (or is it an elk? I don't know). The Museum is usually 10 Euros, but on the first Thursday of every month you can go in for free for the last two hours of the day. Yey. Also known as the Rock Church because it is literally built into the rock. Now we always make a point to visit churches when we go abroad because they're generally free and always great examples of that country's architecture. We rarely feel 'spiritual' in them though, mostly they are boring and some of them are just down right creepy. But this was one of the rare exceptions - it was lovely! Being built into the rock gave it a really natural feel and there was a piano playing in the background which really added to the ambience. It was very peaceful and spiritual and a must see in Helsinki. Okay not the best photo to represent the ice skaters, but we wanted a shot which really shows how big the ice rink is. (Plus when we were there there were only three people skating.) 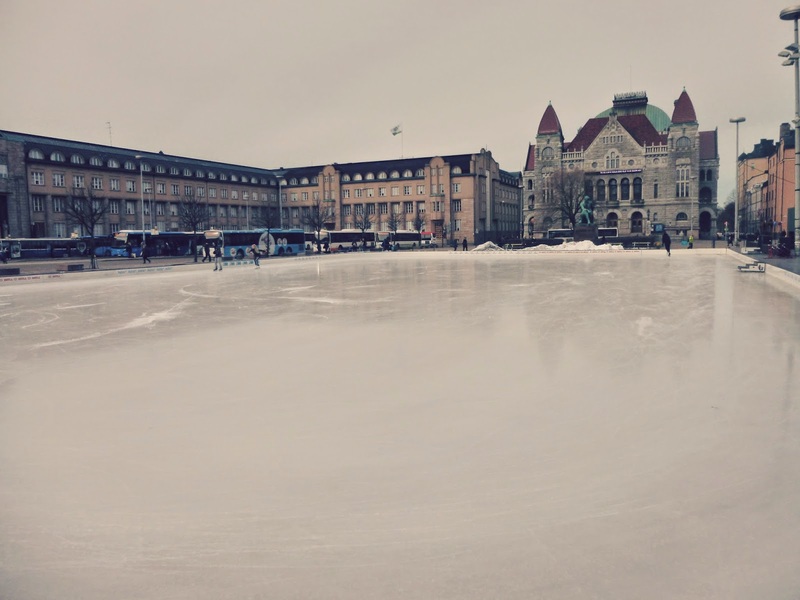 The outdoor ice rink is right next to Helsinki Central Station. 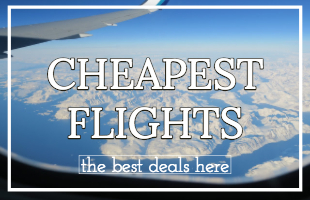 Not free to go on of course, but free to gawk at! 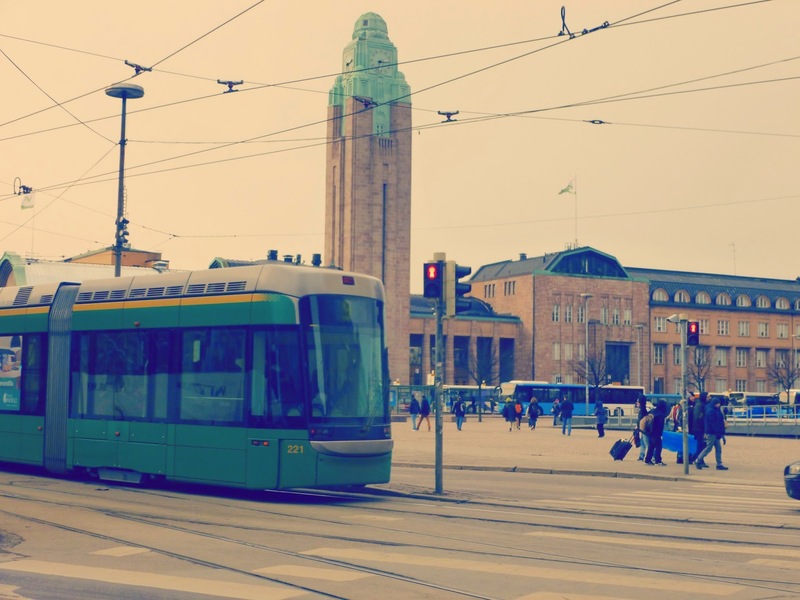 Helsinki has a great tram system, well it actually has a good public transport system in general. The metro is very straightforward and the ticket machines are in English - as are the names of the most important stations (Central and the Uni). The metro tickets are also valid on the trams/buses and some ferries. We took the metro in from Vantaa and our tickets were valid for a whole hour, so we could hop on the trams and see the whole city in the warmth! 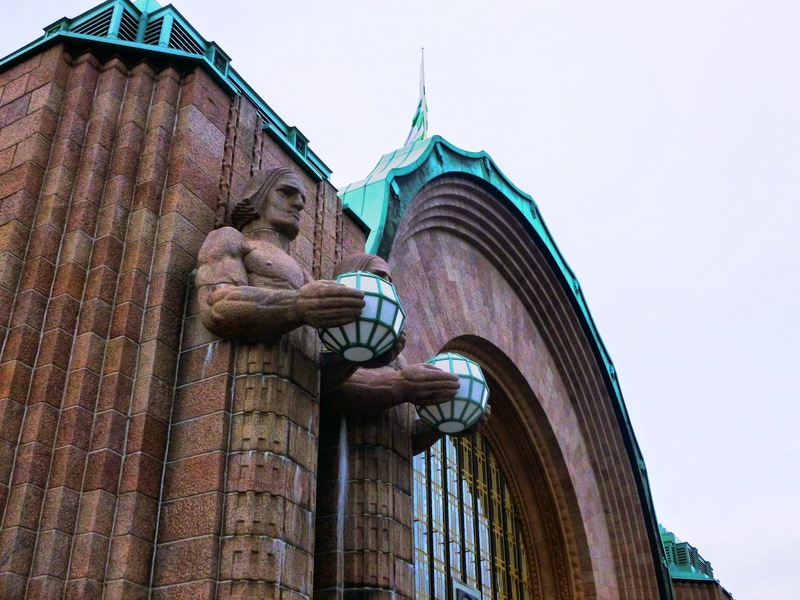 Helsinki Central Railway Station is an impressive building. It was built in 1919 and designed by a Finn. We really liked the strong (Germanic looking) men holding the lanterns. It's very art deco and we liked it a lot. Whilst we're checking out statues of men, it's worth mentioning the Three Smiths Statue. This one is from 1932 and still has bomb damage from the Continuation War (Finland vs the Soviet Union in WW2). What we found interesting about this statue was a) they are naked but more that b) some 'vandal' had covered up their manly parts with Sellotape.. In England vandals can't wait to add willies to art, but apparently in Finland they can't wait to cover them up. Lol. So maybe naked Finnish men aren't your thing, what about women? 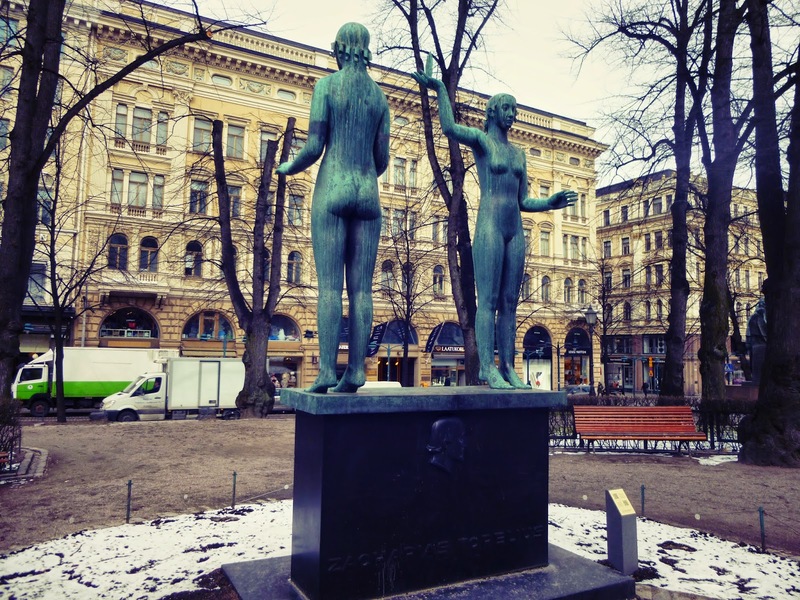 Three minutes walk or so from the Three Smiths Statue is a statue of two naked women. 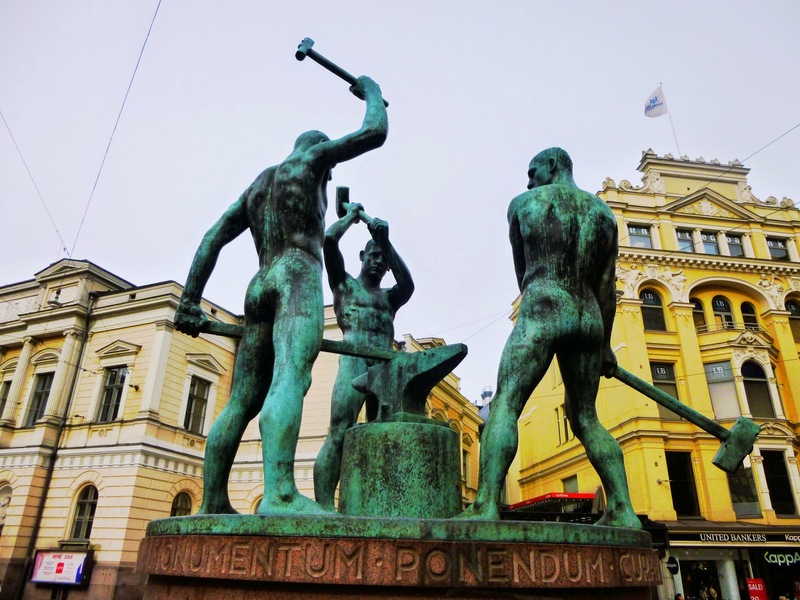 It's a tribute to Zachris Topelius (an author and rector of the University of Helsinki). Market Square is definitely worth a look. 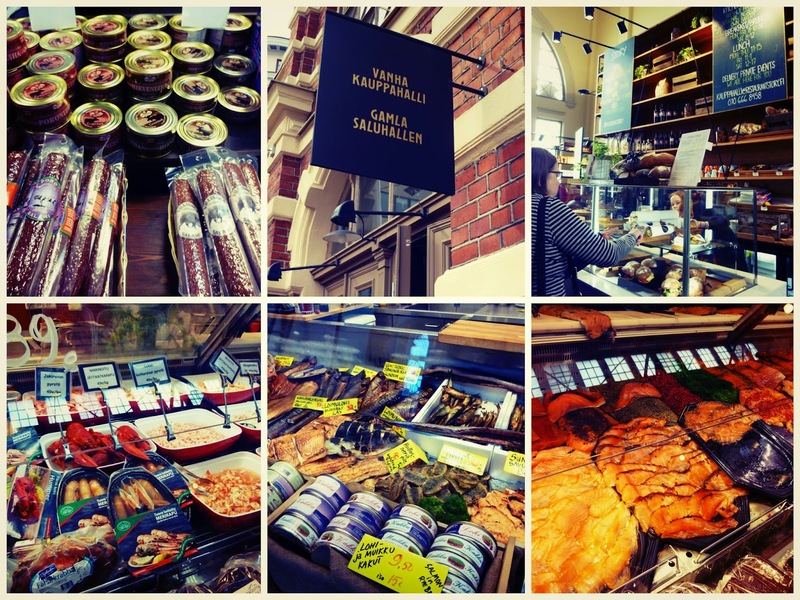 We had some delicious, salty sardines here and a Reindeer Hotdog (tasted exactly like a usual hotdog..). 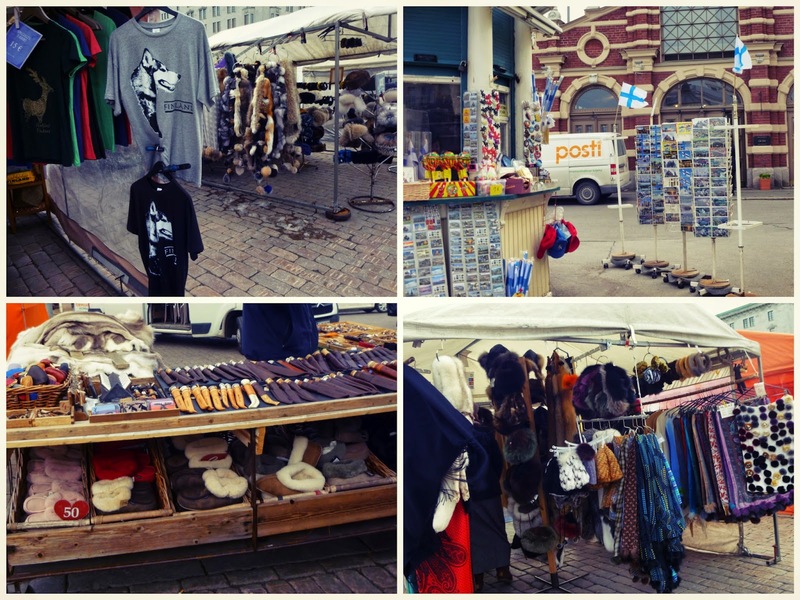 There are lots of touristy things here - reindeer skins, knives, flags etc. 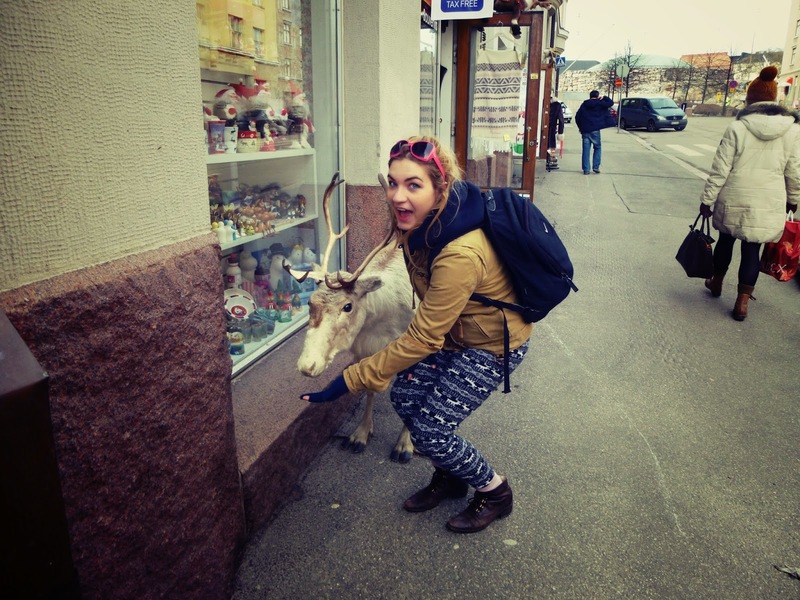 The Reindeer Hotdog cost money of course (and a lot at 6 Euros!) But browsing is free and the sardines were a free sample. All in all an interesting place if you like souvenirs and food (and who doesn't)? Located right next to the market square is the old market hall, which we much preferred to the Market Square. Partly because it's inside (and warm) and partly because the stuff they were selling was cooler - lots of fish, reindeer, wine and wild boar. Yum! Last but not least we have Uspsenski Cathedral, better than Helsinki Cathedral but not as good as the Rock Church. It's Russian and was build in the 1800s. Entrance is free, but they're closed on Mondays. It's certainly an impressive building, but definitely falls in the creepy category in our books - check it out! 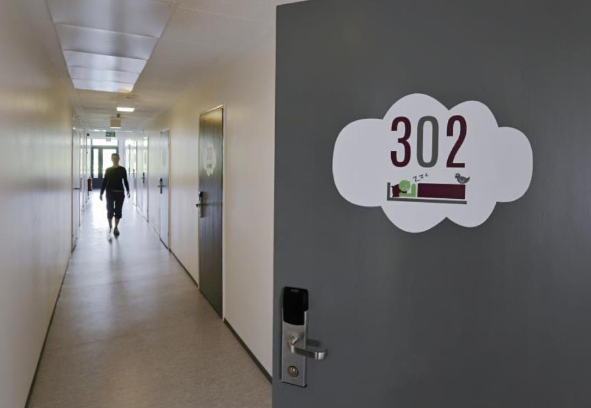 Chances are unless you are couch surfing you're not going to be finding FREE ACCOMMODATION in Helsinki right? 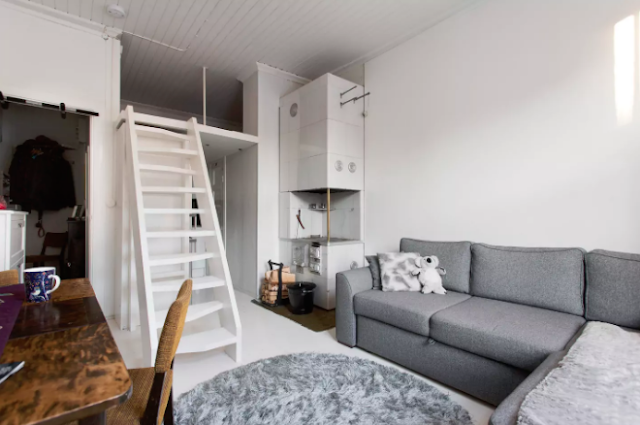 Well we've got an ace up our sleeve which, unless you're brand new to our travel blog, won't surprise you: we House Sat in Helsinki! 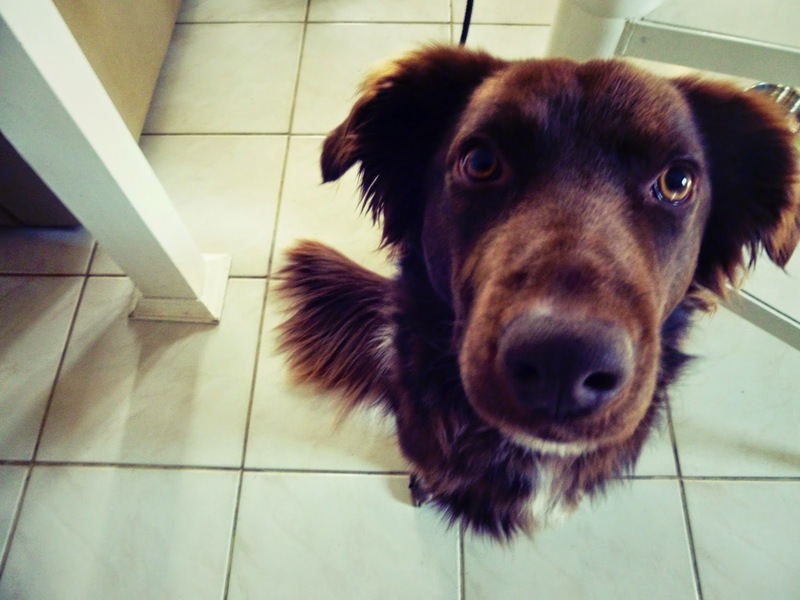 House Sitting = free accommodation in return for looking after the pets and house of a family. 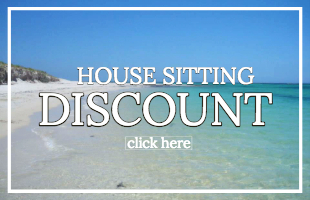 Check out our post about what it's like to House Sit in Finland, you can also check out our favourite House Sitting website to see if they've got any House Sits in Finland AND if you find one you like we can give you a 10% Discount off Trusted Housesitters! 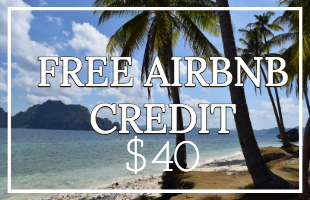 We love AirBnB and although we haven't personally tried it in Helsinki, we've tried it in so many other countries (including Estonia, Hungary and Vietnam) that we're more than confident you will have a good experience with them too. 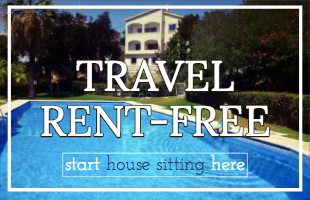 And if you're new to AirBnB we can offer you a £20 AirBnB discount! 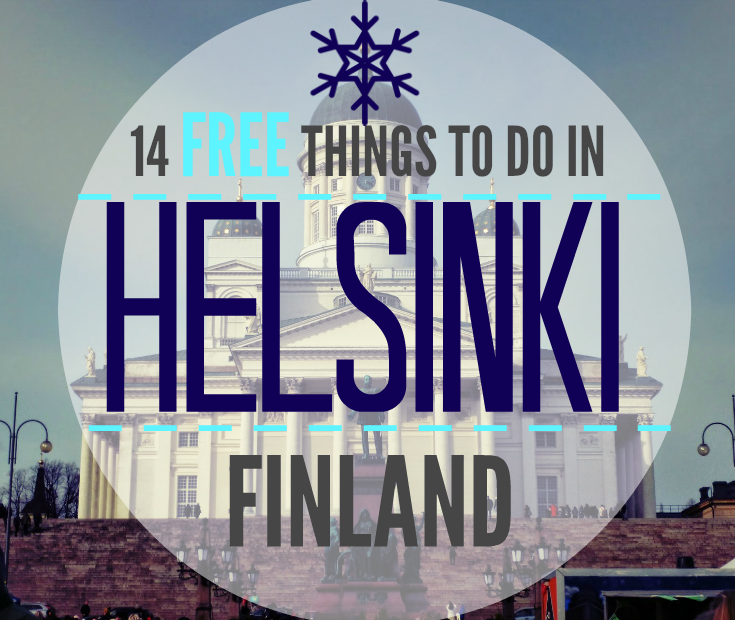 So there you have it, 14 free things to do in Helsinki - most of which are indoors. 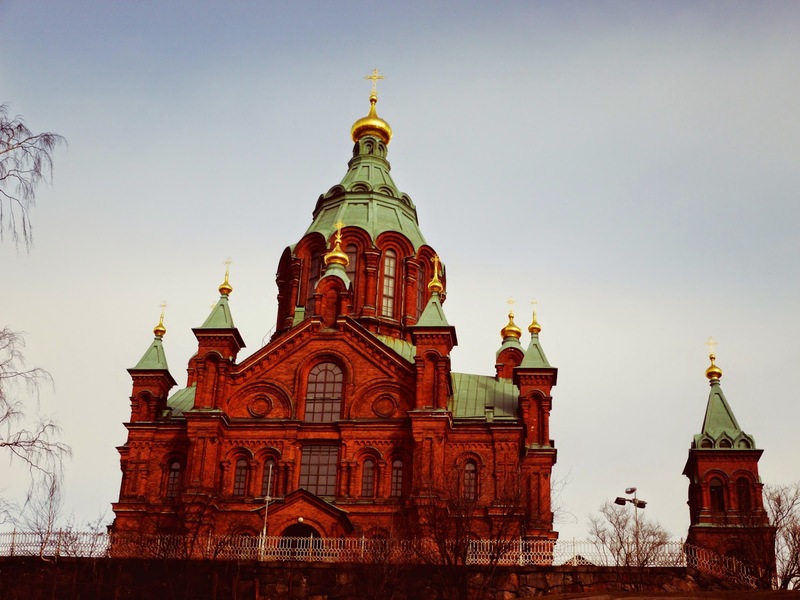 Helsinki is a really interesting place and we hope you like it. And let us know how it goes! And if you haven't already, connect with us on Instagram, Facebook, Twitter and YouTube. Thanks for reading! Have you been to Helsinki? What would you recommend doing?